It’s chess, Jim, but not as we know it. 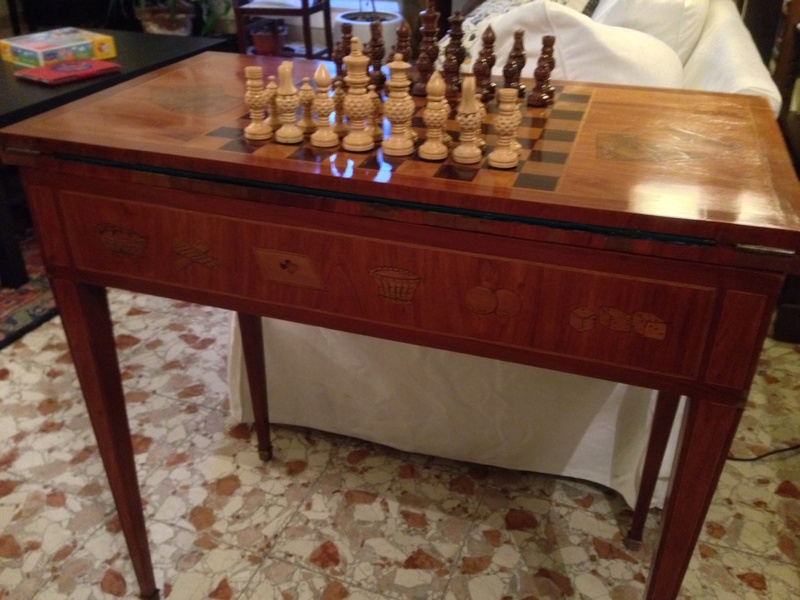 While we were talking to Margarete Armstrong, the woman who was selling the table at an antiques fair in Lecce, she told us that it was made in Sweden because that’s where she bought it. However, later when we examined the table more closely we discovered that it was actually made in France (given away by the stamp underneath). It turns out that this would actually make much more sense because there is a form of French checkers (le jeu de dames) that is played on a 10×10 board. 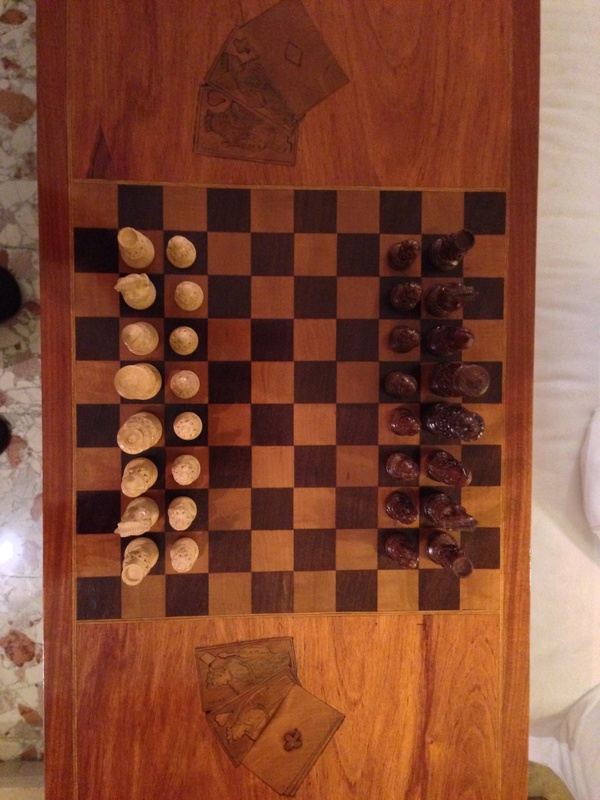 There are also many different variations of chess on an 8×10 or 10×10 board. One example would be Capablanca chess. Capablanca chess is played with the same rules of regular chess but with two extra pawns and two new pieces: the chancellor which moves with the combined powers of a rook and a knight and the archbishop which moves with the combined powers of a bishop and a knight. There are several variants of Capablanca chess, too. Another variant is Jester Chess. This is also played like regular chess with two extra pawns but there are two new pieces for each side named jesters. There are two ways that you can play with jesters. The easier one is that for their first move jesters move like a queen but after that they can only move one or two squares along rows or columns. The more complicated way is that the jester again moves like a queen for the first round but after that they move the same way as the last (opponent’s) piece played. Maybe when we go back to Florence this weekend we can find pieces at Marsili’s for our 10×10 board. Dad adds: It was also fun to see that the playing cards incised on the top of the table have the French names: Charles and Cesar for the Kings of Hearts and Diamonds, and Argine and Judith (spelled ‘Judite’ on our board) for the Queens of Clubs and Hearts. On the sides of the table there are also incised and inlaid designs for dice and dice cups (for the backgammon board inside, though maybe they played jacquet (trictrac had nearly died out by the time this table was made), cards, chips, baskets with and without balls/chips inside (don’t know what these are), and what look like plaques (for poker or other gambling games?). Maybe we’ll have to find an Antiques Roadshow to figure it out. Right-we understand all that perfectly! Our biggest question is not how you got it up the steps, but HOW THE HECK ARE YOU GOING TO GET IT BACK TO INDIANA? Shipping company (packed with lots of books)! 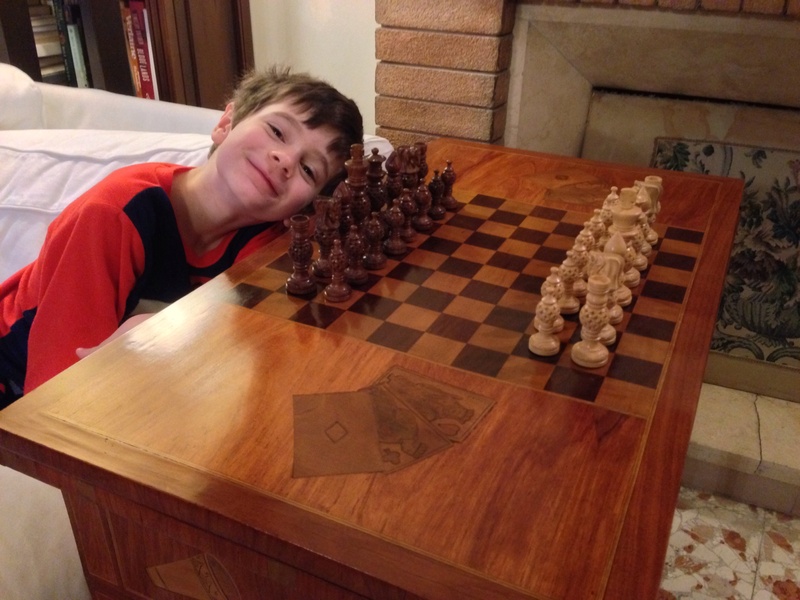 Thanks Simon — for all the chess I played when I was your age and a little older, I never even heard of playing on a 10×10 board with those extra pieces. Thank you for educating me.